Krist Novoselic has responded to critics who slammed his appearance with fellow NIRVANA surviving members over the weekend. When Novoselic‘s band GIANTS IN THE TREES opened for the FOO FIGHTERS — which also includes former NIRVANA touring member Pat Smear — at Seattle’s Safeco Field on Saturday night, September 1, no one expected to see a mini NIRVANA reunion. Dave Grohl invited Novoselic on stage during the FOO FIGHTERS set and the duo performed NIRVANA‘s cover of THE VASELINES‘ “Molly Lips”. 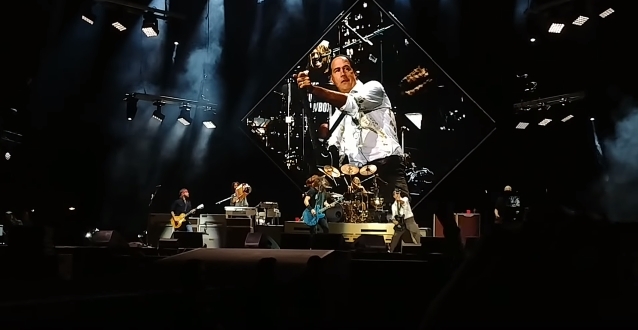 Novoselic last performed with FOO FIGHTERS in 2017 in Eugene, Oregon. For that onstage reunion, they played FOO FIGHTERS‘ classic song “Big Me”. FOO FIGHTERS previously performed “Molly Lips” in Scotland, the home of THE VASELINES, in September 2015. Fans may get treated to another reunion at Cal Jam 2018 on October 16 in San Bernardino, California. GIANTS IN THE TREES and FOO FIGHTERS are both on the festival bill. NIRVANA‘s “Molly Lips” cover was included on the band’s 1992 album “Incesticide”.